Grid reliability has emerged as a central theme of DistribuTech 2018. Last year was a tough one for utilities trying to keep the lights on and restore power in the midst of hurricanes, polar vortices, and other extreme weather events. So it's no surprise grid reliability is a big focus of the new technologies and services being unveiled at this year’s DistribuTech conference. The grid industry conference in San Antonio, Texas opened Tuesday with a flurry of awards for utility resiliency projects, such as New Jersey utility PSE&G’s Energy Strong project to network and harden substations in the wake of Hurricane Sandy, and California utility Pacific Gas & Electric’s Blue Lake Rancheria microgrid project. But there's still a lot of work ahead. 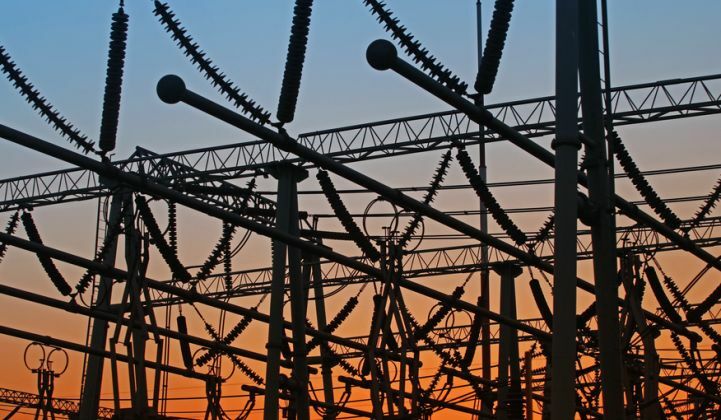 According to the latest data from S&C Electric Company, utilities need to do much more if they want to help big commercial and industrial (C&I) customers with their energy reliability concerns. On Tuesday, the grid technology vendor released its reliability report, built on surveys of more than 250 energy managers of commercial and industrial businesses averaging $4 billion in annual revenues. The findings reveal that nearly three-quarters of companies “own or plan to develop alternative energy sources, supplementing their current provider’s generation and power reliability," the report states. As S&C notes, research from Lawrence Berkeley National Laboratory shows that power outages cost the U.S. economy about $79 billion a year, with 98 percent of the economic impact affecting commercial and industrial customers. And of the customers S&C surveyed, 25 percent reported that they experience power outages at least once a month. We’ve been tracking this evolving market for on-site power, which ranges from revamping diesel and natural-gas-fired backup generators with demand response, to combining solar power, energy storage and other distributed energy resources (DERs) into self-sufficient microgrids that can disconnect and reconnect to utility grids. Siemens has been investing a lot of time and money into the microgrid opportunity, as we’ve reported from DistribuTech conferences in years past. On Tuesday, the German power and grid giant unveiled its latest iteration on this front -- a Microgrid Management System, meant to give operators the ability to handle much more complex operations between microgrids and utility operators and energy markets. Siemens’ first publicly revealed test site for its microgrid management platform is at PG&E’s Blue Lake Rancheria project in northern California. Using 500 kilowatts of PV from REC Solar and 950 kilowatt-hours of Tesla batteries, along with a backup diesel generator and building energy management from Johnson Controls, the microgrid can keep the remote Native American reservation’s community center and a designated Red Cross evacuation site running on its own power for up to seven days. When the grid isn’t down, the solar reduces energy costs and greenhouse gas emissions, while the batteries are available for demand response. This combination of reliability and everyday energy savings won the project a DistribuTech award Tuesday for best DER integration project. Mike Carlson, president of Siemens' Smart Grid North America division, said in an interview that the Siemens microgrid management platform is also being used by San Antonio municipal utility CPS Energy, as well as in projects with NREL and Duke Energy, and with Con Edison in the Brooklyn community solar project. The difference between this new platform and Siemens’ previous microgrid devices lies in its ability to give operators insight and control over the site’s operations outside of grid emergencies, he said. “Our microgrid management [has] more enterprise control; it has operator situational awareness and intervention," said Carlson. Siemens is also looking at how these managed microgrids can integrate with broader DER management. “Demand response and all the things going on in the distribution system can be combined into a distributed energy resource management solution," Carlson said. Siemens is working on this as part of its work with Southern California and San Diego Gas & Electric, as well as with utilities in Canada. Much of the modern electric grid lies underground, not overhead. Underground circuits make up an increasing share of the U.S. distribution grid network, providing significant protection against storms and other interferences. But these underground networks, built with successive generations of equipment that are mostly lacking in modern sensors and telemetry, can also be difficult to monitor for grid operators. This can become a significant problem for utilities, particularly those that are trying to manage increasing penetration of rooftop solar and other DERs on a system with protection equipment designed to prevent two-way power flows, all tied into a mesh network that can face cascading outages if these automated responses spin out of control. On Tuesday, Oracle Utilities released a new version of its network management system software -- its version of what most other grid vendors call an advanced distribution management system, or ADMS -- that’s built to bring visibility to these low-voltage, secondary mesh underground networks. The press release claims that it’s “one of the only providers offering detailed analysis and modeling capabilities that are available out-of-the-box” for underground networks. This lack of competition may be due to the fact that, for the most part, underground mesh networks have been “so reliable that they haven’t needed a lot of tools and visibility to manage them,” Brad Williams, vice president of Oracle Utilities product management, said in an interview. This reliability has led to a lack of management oversight over the utility departments that operate these networks, with a lot of them developing a “totally different process than the rest of their distribution systems, with only a few people who know what’s there and how to operate it," Williams added. “The problem is, when things do start to fail, it can be pretty detrimental and cause extended outages,” he said. Oracle’s new platform “has the tools to do more extensive modeling, and determine the behavior of these mesh networks,” providing power flows and state estimation both for real-time operations and for longer-range predictive forecasting, he said. Oracle is also targeting Europe, where distribution networks are built to serve hundreds of customers per transformer, not tens of customers as is common in North America. These networks have likewise proven reliable enough without sensors and telemetry to give utilities little incentive to invest in them, leaving them with little visibility into how increasing levels of customer-owned solar PV and other DERs will affect them. Oracle's new software provides data management processes, as well as the network and the modeling capability, all of which -- to no surprise -- relies on data, which comes from sensors. Sentient has become one of the larger providers of sensors for overhead distribution grids, assisted by its early move to integrate its devices into the networks controlled by smart meter and grid networking provider Silver Spring Networks. Silver Spring was bought by rival Itron last year in a deal that was formally concluded earlier this month, making the combined companies one of the largest AMI and grid networking providers in the world.